Ateret Cohanim announces purchase of 'large strategic' building by Old City, plans to turn into Jewish religious school. 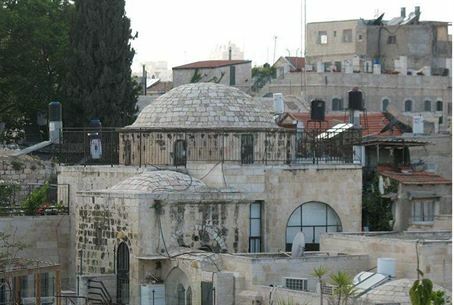 Ateret Cohanim, an organization buying properties for Jews in Jerusalem's Old City, announced Thursday it had bought "a very large and strategic building" across from the Old City in a commercial Arab neighborhood. The group intends to turn the building into a religious Jewish school, writes Middle East Monitor, citing Haaretz. Ateret Cohanim's efforts are particularly meaningful given the fact that US Secretary of State John Kerry's peace plans propose turning eastern Jerusalem into an Arab capital. According to the report, Daniel Luria, executive director of the group, noted they had "bought more than 1,000 square meters in a big and strategic building located in front of the Old City, in the area between Al-Amoud (Damascus) and Al-Sahera (Herod's) Gates. It is the building of the central post office." During the Jordanian occupation of the 3,000-year-old Jewish capital, from the War of Independence to the Six Day War, the building served as a post office and police station. An e-mail message sent to members of Ateret Cohanim noted the building was bought thanks to a generous donor, and added the group would gain control of the building during Passover in mid-April. "To those who support the vision of a unified Jerusalem, and to those who believe in the right of any Jew to study and live anywhere in Jerusalem, it is the time to reinforce the Jewish existence in the heart of Jerusalem," read the e-mail, asking for donations to build a kitchen, bedrooms, security room and offices in the school. According to the message, this is the largest-ever Jewish purchase in Arab-occupied section of the Old City. Evidently the building had previously been rented to the Israeli Post Authority by the Israel Land Authority. Jerusalem Councilman Aryeh King's Israel Land Fund has similarly been active purchasing land for Jews to strengthen their hold over their historical homeland. In his role as councilman, King has pushed plans to "judaize Jerusalem" by expanding Jewish presence in the eastern part of the city, and by urging Arab residents to leave the country.